This week I decided to take the challenge on that a fellow artist put to me. He made some nice comments about a painting I did last year that is an abstract. He then said, "You ought to do more of these." This was a particular challenge for me, because I didn't really have an image in my head or a drawing to refer to as I painted along. I just glued some white tissue paper down on my canvas and moved it around with my fingers to create some interesting wrinkles and shapes. It's another step out-of-the-box and toward my goal this year to see what new art will develop if I do something a little out of my comfort zone. Abstract art is non-objective, that is, it depends on intrinsic form rather then true realism. That's why it can be tricky, but still delightful. You really are not in total control. Sort of a devil-may-care approach! Anyways, here's what I came up with when I stepped out-of-the-box this week. This I call "Dance with Love" in honor of Valentine's Day. I did actually try to encourage the tissue into a moving or dancing form. But I had no preconceived notion about the rest of the painting. It just sort of developed as I went along. The medium is acrylic gouche and the piece measures 6x9in. Here is the second painting I made using the tissue technique, which incidentally I glued onto the canvas with soupy gesso medium. "In the Grass" is also 6x9in. These are both great Patricia but you know i love your work. 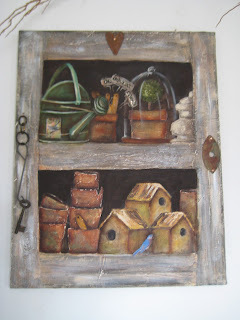 And i love building up layers on my work most of mine have items glued on to add texture. I love the dancing with love, you really captured a lovely vision of a women. It almost looks like a digital enhancement. (Which I know nothing about) but have seem them. So Cool that it was intuitive. I also admire you for putting the bible verse on your blog, very special. I was getting ready to buy some gouche, I'd just heard about it. So many things I'd like to do, so little time. patti, these abstracts are beautiful! AND they can be perfect for licensing...you may have found another niche for your artwork! Seriously, these can be licensed onto paper, fabric, etc. !